Simon Says Make it Masculine! As luck would have it the Monday Challenge also has the same theme so you could join in with both! As always, Simon has a $50 voucher to shop at the fabulous Simon Says Stamp Store ready for one lucky winner! I used Tim Holtz’s Distress Oxide inks along with Simon Says Stamp stamp set and dies to make my card for the challenge. The panel is Tim Holtz distress watercolor paper. I sponged Faded Jeans and Broken China distress oxide inks on the centre of the panel fading to the edges. I added some clean clear water spatters to add interest. Once dry, I die cut the panel using the Postage Edge die from Simon Says Stamp. 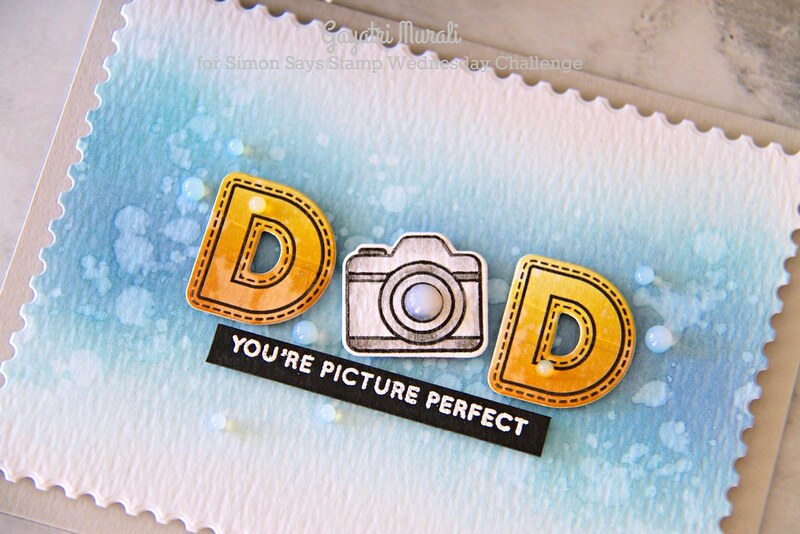 For the focal point, I used Simon Says Stamp Mom and Dad Icons and coordinating dies. Again I used distress oxide inks Fossilised Amber and Spiced Marmalade on distress watercolor paper. Then stamped the “D” on the paper with black ink and cut the image out using the coordinating die. I also stamped the camera image from the stamp set on watercolor paper, coloured using Zig clean brush marker pen and die cut using the coordinating die. I adhered them on the middle of the postage stamp edge panel using foam adhesives. The secondary sentiment is white heat embossed on black strip of card stock and adhered below the focal die cuts. The panel is adhered on Fog card base and a few glossy accents finish the card. EDITED: I forgot to tell you. 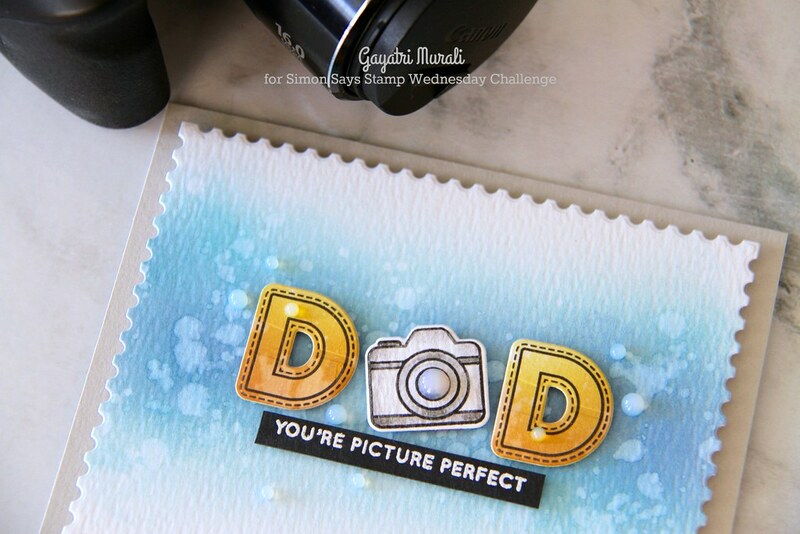 Simon Says Stamp Monday Challenge Blog also has the same theme. Enter your card for both the challenges. Yay! 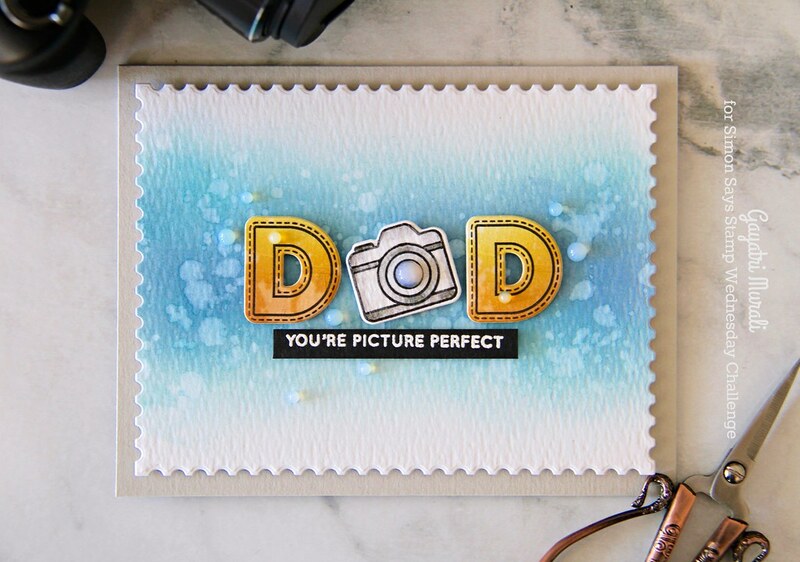 Saw this card on the SSS challenge blog and loved it! Very creative with the camera. I will be pinning this one for sure! Love your brilliant play with DAD and camera!! AWESOME design as always, Gayatri!! Fantastic card!SImple, yet super cool!Love it!